1. Warm a medium-large skillet over medium heat and add the olive oil. 3. Carefully pour the beans into the pan, along with their broth (if all the beans don’t fit, start with half the beans, then add more as they cook down). If using unsalted beans, add a pinch or two of salt. Turn the heat to medium-high and use a potato masher to mash the beans into a soupy, lumpy puree as they simmer. Keep simmering and mashing and stirring the beans for about 8-10 minutes, uncovered. As the liquid evaporates, the beans will gradually thicken and get more flavorful. 5. Turn the heat to low and taste them. Beans like salt, so if they taste bland, don't be afraid to add a pinch or two. If you started with flavorful beans (like frijoles de la olla) they might be perfect. If they are too salty (unlikely but possible), stir in some water and continue to simmer until they seem ready again. When they taste so good you just want to keep eating them, you are done! Why are they called refried? This is an Americanization of the Mexican-Spanish word refritos which means thoroughly sauteed. As you can see from this recipe, they are not "fried" at all. Which brings me to a pet peeve: Refried beans are NOT junk food! In fact, they're really good for you. (This is not a health-food website, but this is one of those topics that drives me so crazy I just have to speak up.) A lot of Americans hear the word "refried" and think this must some sort of "fried" junk food. It's not! Refried beans are just beans (super nutritious), sauteed in oil - the same exact oil you might saute spinach in, and no one is calling spinach junk food. 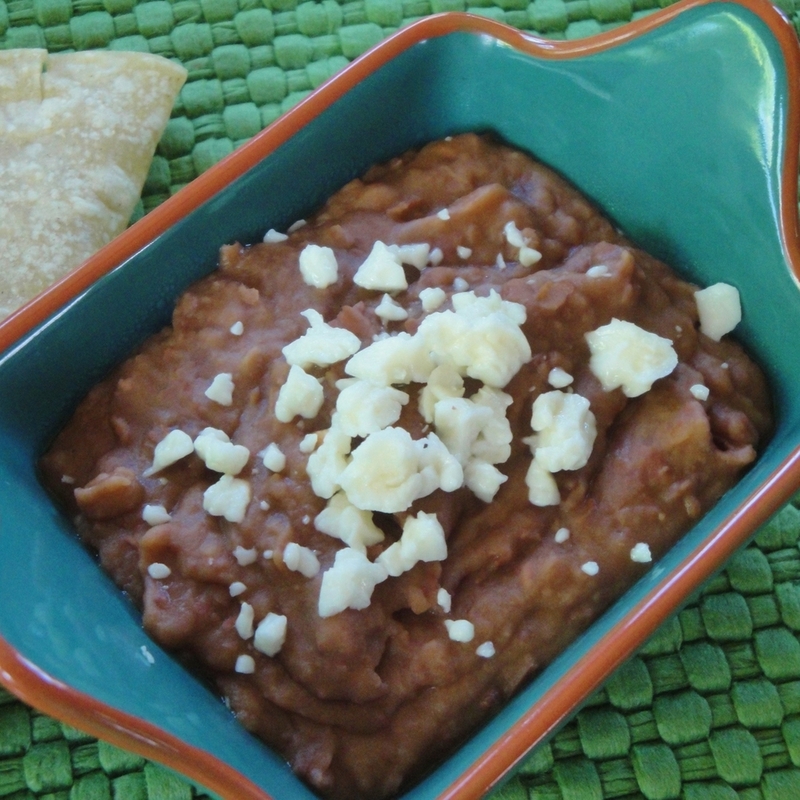 Can we all please respect refried beans as real food? Thank you. If you are using canned beans, read the label. Ideally, the ingredients should be simple: beans, water, salt and onion. Less is more for authentic Mexican flavor. I'd choose unsalted beans over heavily seasoned beans (eg, with cumin, chile powder, etc. ), and add flavor myself with onions and salt as described in the recipe. These can be made ahead and stored in the refrigerator for several days, or in the freezer for months.